The Lemosho Route approaches from the west. It is a very beautiful and unspoilt route that still enjoys sighting of wild game along the forest section. Ideal for those seeking a quiet route away from other climbing parties. This is the route followed by The Red Nose Climbers. The journey time to reach the start point is quite long and joined to the possibility of not reaching the end of the road by vehicle head torches may well be needed to reach Forest Camp on day 1. The trek starts at the Londorossi Park Gate, located on the western side of Kilimanjaro. From the trailhead at Lemosho Glades, the route ascends through pristine rainforest on trails that are overgrown in places with rich flora and fauna. This quiet route leads us up into the moorland zone of the Shira Plateau providing time to acclimatise. The views from the plateau, across the mountain and to the plains below, are spectacular. The route then across the Shira Plateau allows side trips to the minor peaks of Kilimanjaro’s third summit, the Shira Ridge and Shira Cathedral - useful for more acclimatization. Our particular route will also visit the Moir Hut on the north-western side of the mountain. 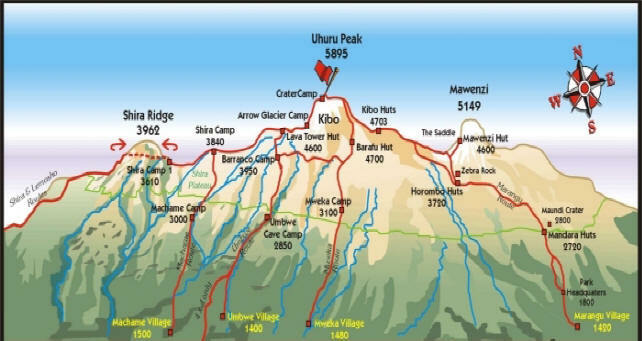 We have arranged with Team Kilimanjaro to combine Lemosho approach route with an ascent via the Western Breach (a huge, steep, gash in the southern side of the mountain, with some scrambling on rock), and a night camping in the crater after summiting Uhuru Peak. Mt Meru (4562m) is an active (but dormant) volcano that towers above Arusha town, some 70km west of Kilimanjaro. It provides a perfect acclimatisation climb prior to the main event on Kilimanjaro. But Meru is a challenging climb. 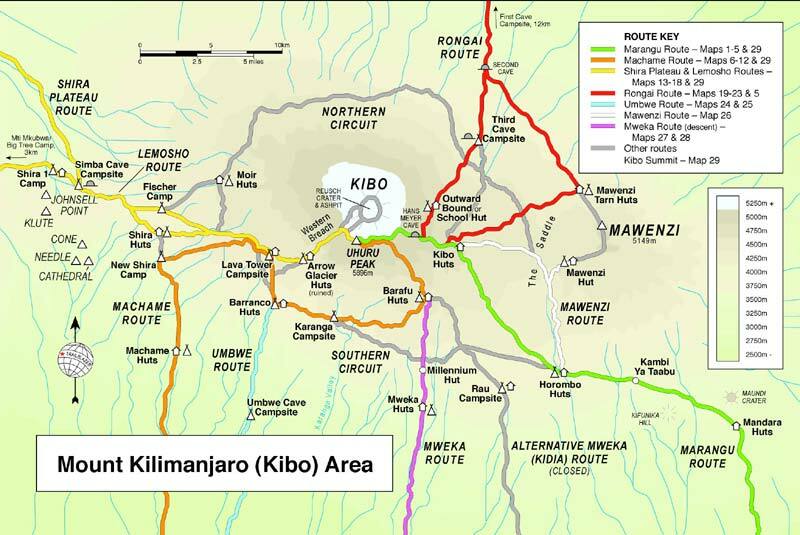 As with Kilimanjaro, the route to the summit passes through parkland, montane forest, a giant heather zone and moorland. Finally, the summit is reached by a narrow, barren, knife-edge ridge which surrounds the western side of the crater (the eastern side was blown away thousands of years ago in a massive explosion). The ridge ascent provides stunning views of the Ash Cone lying several thousand feet below in the crater and Kilimanjaro in the background. The inner walls of the volcano rise over 1,500m from the crater floor. Over 400 species of birds, rhino, elephant, buffalo, baboon, warthog, black and white Colobus monkey and duiker are all found in the forests and lower slopes. We have arranged to spend the third night again at Saddle Hut to provide for extra acclimatisation and on the fourth day to be picked up by vehicle from the top of the vehicle track at the crater lip – to avoid unnecessary a painful slog down and wear and tear on the knees on the descent before starting Kilimanjaro on the following day.